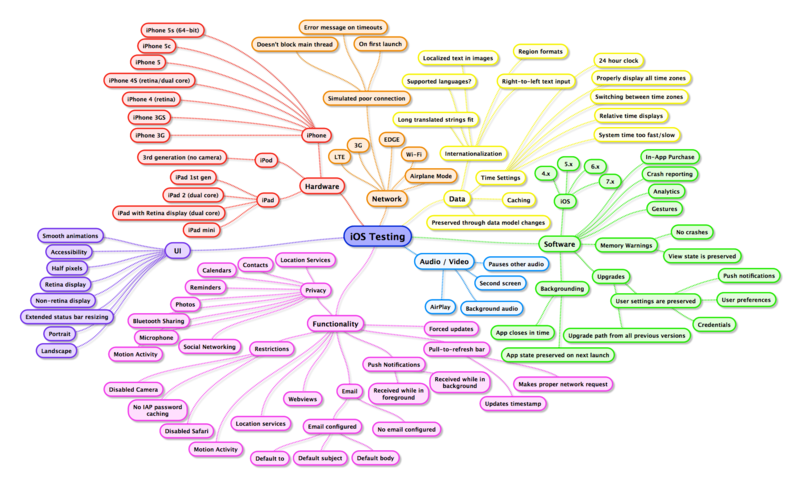 Nearly a year since the last refresh of the iOS testing mind map, it seemed due for an update. The changes in this version are outlined below. Once again, this mind map seeks to be thorough without getting so detailed as to become unmanageable or unhelpful. The mind map is not exhaustive, but helps serve as a template that you can customize to suit the needs of your apps. Anyone wishing to modify the mind map can do so by downloading SimpleMind Free and the SMMX mind map file (you may need to right-click to save), then dragging the file onto the SimpleMind app icon in your dock. Clicking on the image above will take you to a full-resolution PNG. You can also download this zip file which contains PDF, PNG, text, OPML, MM and SMMX versions of the mind map.